We needed a fast meal. We decided on Sloppy Joes, adding some veggies to it. To make it even faster, I started on the sauce as soon as I started browning the ground beef (each done in a separate pot). You could totally start with the meat, and continue adding the rest of the ingredients TO the meat. My kids like these with glazed or buttered carrots. And cherry tomatoes, but there is very little that does NOT go with cherry tomatoes for my kidlets. Heat 1 tablespoon of oil in a large pot. Brown ground beef over medium-high heat till cooked through. Drain, and set aside. Heat 1 tablespoon of oil in same pot. 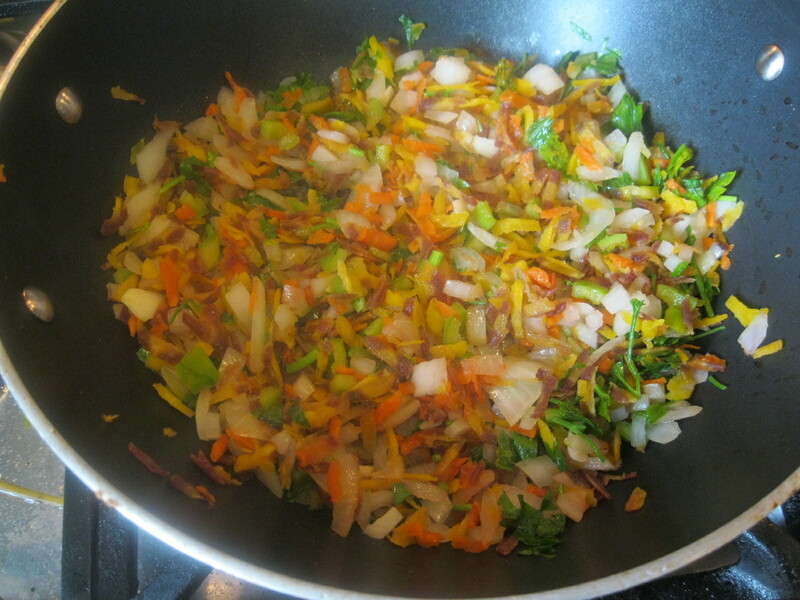 Add onions, garlic, carrots, parsley, and green pepper. Sauté for 2 minutes over medium-high heat. Add ½ salt. Stir, reduce heat to low-medium, cover, and allow to sweat for 10 minutes. Add the rest of the sauce ingredients (tomato sauce through mustard). Stir well, and bring to a boil. Reduce heat and allow to simmer for about 20 minutes. Return ground beef to sauce, and stir. Allow to cook another 2-3 minutes. Note – to make it spicy, you can add Hot sauce, or red pepper flakes. You could leave the meat in, and add everything to the meat, instead of removing it. I wrote the recipe this way, because I had the meat and sauce both going concurrently to save time, and combined at the end. Great! I am glad I could help with this post 🙂 Please let me know how it turns out for you!